Source: Compiled by Homecoming II Project 15 May 1990 from one or more of the following: raw data from U.S. Government agency sources, correspondence with POW/MIA families, published sources, interviews. Updated by the P.O.W. NETWORK 1997.
capsule installed in the bomb bay, that accommodated four technicians whose responsibility was to operate electronic reconnaissance gear. On July 20, 1966, an EB66C was dispatched from the 41st Tactical Reconnaissance Squadron at Takhli Airbase in Thailand on an electronic countermeasure mission over North Vietnam. The crew and technicians that day included Captain Lawrence Barbay, Captain Glendon W. Perkins, Captain Norman A. McDaniel, Captain William H. Means Jr., First Lieutenant Edward L. Hubbard, and First Lieutenant Craig R. Nobert. Nobert served as the electronics warfare officer on the flight. seen to eject the aircraft, after which the aircraft descended and disintegrated. In the spring of 1973, 591 Americans were released from prison camps in Vietnam, including most of the crew of the Skywarrior lost on July 20, 1966. They had been held in various POW camps in and around Hanoi for nearly seven years. Only Nobert remained Missing in Action. A Connecticut family was at Arlington National Cemetery in Virginia on Wednesday for a funeral with full military honors, but the Air Force pilot being remembered lost his life more than 40-years ago during the Vietnam War. From the bugle to the rifle volleys to the riderless horse accompanying the caisson, it was a military funeral with all the solemn fanfare of Arlington National Cemetery. 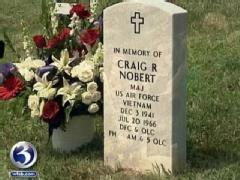 After decades of waiting for answers, it brought comfort to the family of Major Craig Nobert. Major Nobert's plane was shot down in July 1966. The Avon native was listed as missing in action, and for years, his late father was diligent in keeping up with the latest information from the government, but the rest of the family said it was kept in the dark. Wednesday's ceremony in the hallowed northern Virginia cemetery came during a convention for families of servicemen and women listed as missing in action or prisoner of war. Nobert's family said it's an honor shared with all who have served. The Nobert family was also given a full briefing from the Department of Defense from the day their loved one was lost. They said they hope it will allow them to honor Nobert and finally be at peace with what he sacrificed for his country.